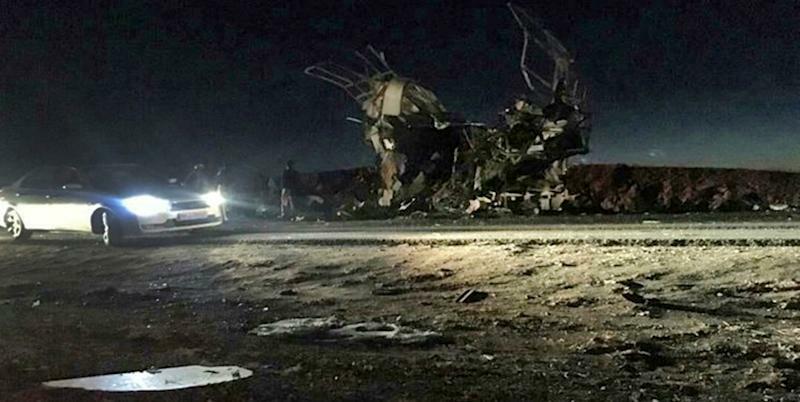 Tehran (AFP) - A suicide attack on Wednesday on a Revolutionary Guards bus in southeastern Iran killed at least 20 people, the official news agency IRNA reported. A picture released by the Fars news agency showed a hulk of twisted metal at the scene. The attack took place in the volatile southeastern province of Sistan-Baluchistan which has a large, mainly Sunni Muslim ethnic Baluchi community which straddles the border with Pakistan. And in early December last year two people were killed and around 40 others wounded in the port city of Chabahar, also in Sistan Baluchistan, in an attack which Foreign Minister Mohammad Javad Zarif at the time blamed on "foreign-backed terrorists" -- a reference to Sunni Muslim extremists.